Let me be clear, I am not a buyer of the preferred but was asked to opine on them. 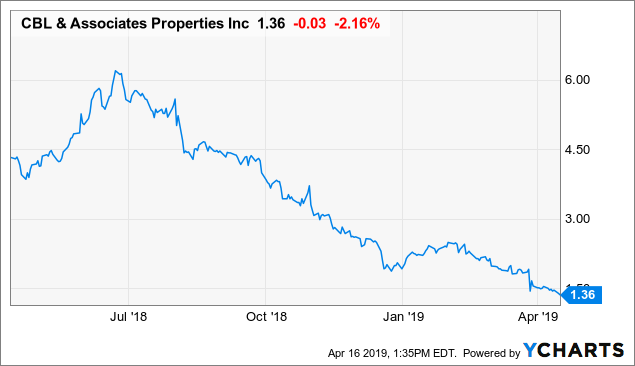 CBL is a financially weak mall REIT that will, at best, struggle for years to recover. My thoughts on the preferred stock. Let me begin this note by stating the company I am writing about is distressed and I don't like it. I won't invest in it and I have cautioned others from doing so. If you are reliant on income from investments, or just have a lower risk tolerance, you might want to close this note and move on. If you own the company and are reliant on income from investments, or just have a lower risk tolerance, you should really assess why you own this company and what your outlook for the space is. Okay, with all of that said, and the inevitable thought that many will have that I am short the securities of this company, let me just say that I am not. I have no risk position here. I was asked to opine on the preferred stock of this company, and so I shall. CBL & Associates (CBL) owns, develops, leases, manages, and operates regional shopping malls, open-air and mixed-use centers, outlet centers, associated centers, community centers, office and other properties. Its properties are located in 26 states, but are primarily in the southeastern and midwestern United States. CBL owned a controlling interest in 59 Malls and non-controlling interests in 8 Malls as of December 31, 2018. 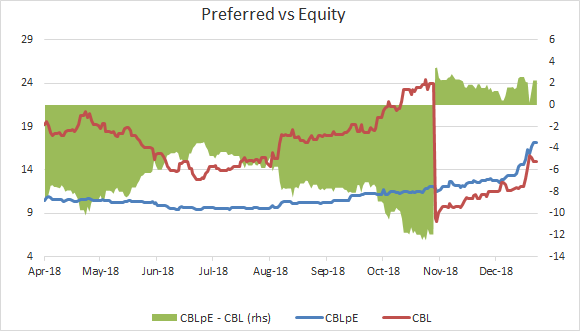 The suffering of CBL shareholders is widely known and is best evidenced with the following two charts which show market perception and the distressed nature of the REIT. The equity now trades for 90% of 2019 estimated FFO, which implies that FFO will continue to drop and investors aren't willing to pay a dollar for every dollar of estimated FFO. This really seems to sum up the outlook for this mall REIT. There are many causes and implications which have been widely discussed on Seeking Alpha and should you want to dig deeper into them, as well as many opinions as to the potential outcome, the Seeking Alpha landing page for the stock is a great place to start. Recently, the Owl has taken the opposite view of mine, makes valid points and is worth a read. I have been asked to opine on the preferred stock, so let's get started. 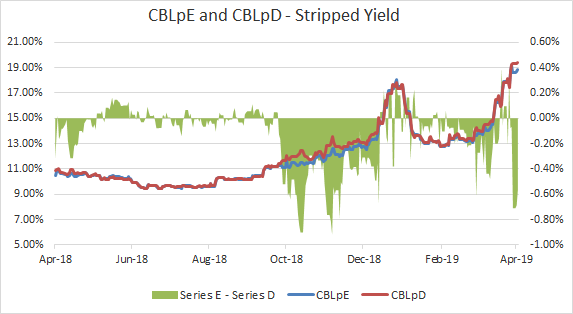 Based on the table above, from a yield perspective, the Series D (CBL.PD) is better than the Series E (CBL.PE) for investors initiating a position at this time, given its higher yield and $0.43 higher price. Typically, in a situation like this, you would want the lower price in order to commit less capital and increase the return in a bankruptcy situation. The simple fact is that in a bankruptcy, both of these securities are going to be zeroed out and there will be no recovery, so the focus is on the maximum cash flow to the investor. 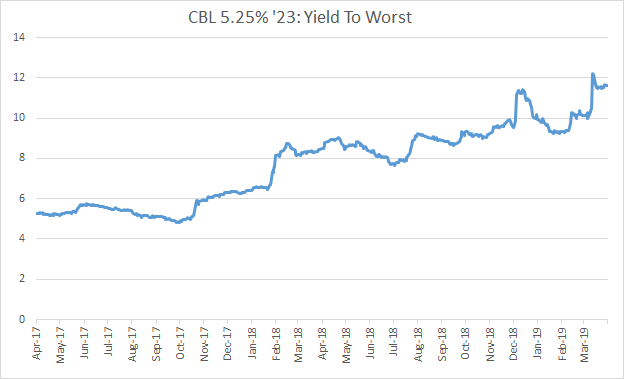 The spread between the two series (86 basis points on a stripped yield basis) is approaching its wides and, as a result, makes the Series D look cheap versus the series E on a current basis as well as relative to the last year. Naturally, the spread difference made me think there was a legal/financial difference between the two. The only difference I could find in my review of the two prospectuses (lined at the end of the note) is that the Series E have change of control language (and the conversion feature of that language) that the Series D do not have as it was not a "thing" in 2004 when the Ds were issued. There is, but it favors the Series D.
As a result, I believe that the Series D is the series to go with if you want to initiate a position. 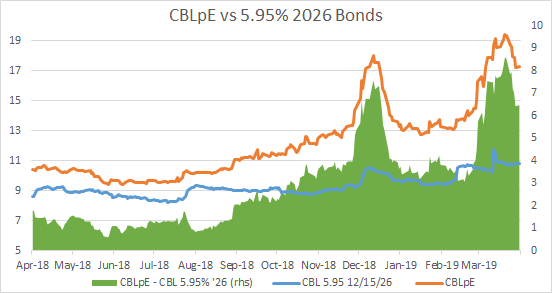 For Series E holders, the bid/ask spread will eliminate some of the yield spread and should be looked at prior to considering a swap. 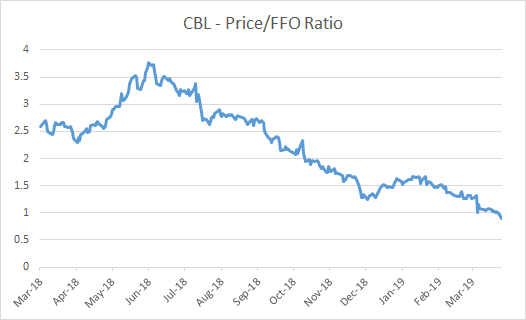 Normally, I include a look at peers, but there is no peer that is close to the level of distress (as measured by the market) that CBL is. That said, the following are outstanding mall preferred stocks. I include it purely to show the massive gap between CBL and its peers. 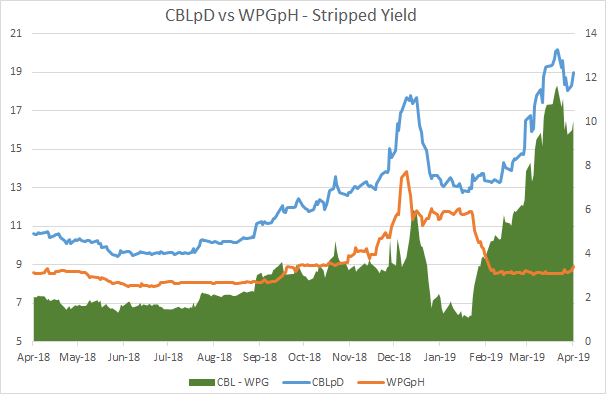 The best comparison, if there is one, is the Washington Prime (WPG) Series H (WPG.PH) preferred. There is an approximate 1,000 basis point (10%) gap between the two. 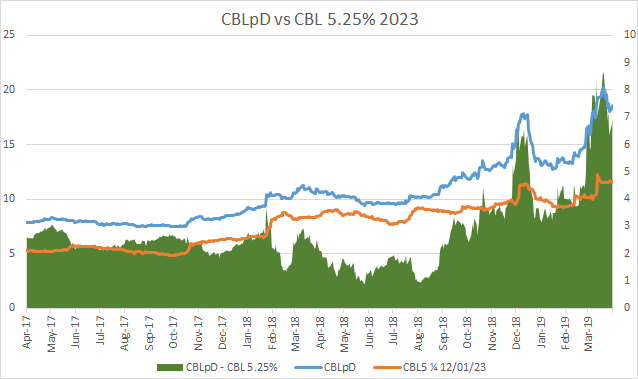 I think I have made the case that if you want to buy a CBL preferred, the Series D is the one to go with. The company is razor-thin on cash. So much so that a $60-million dollar agreement ($90mm with attorney fees) forced the company to cut its equity dividend for two quarters in order to ensure the requisite amount of cash to pay the settlement. (release here). 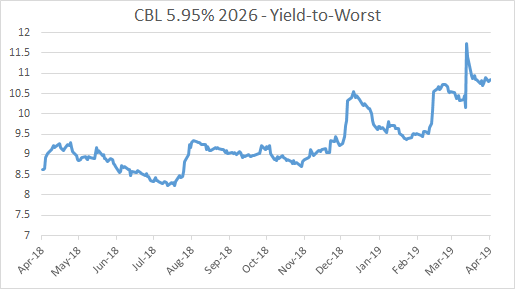 Given the leverage of the REIT, any drop in releasing spreads will have a magnified impact on FFO and the ability to pay dividends and redevelop its malls. The company wants tenants to contribute to the redevelopment of its malls (and have those contributing capital share in the upside) which will preclude the full benefit of redevelopment from dropping to FFO. The REIT stepped up its impairment last year ($174 million from $71 million in 2017) which will affect its covenants. I view the potential impairment of assets as a significant risk for the REIT. We monitor events or changes in circumstances that could indicate the carrying value of a long-lived asset may not be recoverable. When indicators of potential impairment are present that suggest that the carrying amounts of a long-lived asset may not be recoverable, we assess the recoverability of the asset by determining whether the asset’s carrying value will be recovered through the estimated undiscounted future cash flows expected from our probability weighted use of the asset and its eventual disposition. In the event that such undiscounted future cash flows do not exceed the carrying value, we adjust the carrying value of the long-lived asset to its estimated fair value and recognize an impairment loss. ...Further, while the Company has not experienced any non-compliance with debt covenants as a result of the impairment analyses described above, it is possible that future reductions in the carrying value of our assets as a result of such analyses could impact our continued compliance with certain of our debt covenants that require us to maintain specified ratios of total debt to total assets, secured debt to total assets and total unencumbered assets to total debt. During 2018, we recorded a loss on impairment of real estate totaling $174.5 million, which primarily related to four malls. In January 2019, we closed on our new secured $1.185 billion bank facility which recast our existing lines of credit and term loans. This financing achieved a number of important goals for us including the elimination of a large facility fee, simplification of our covenants to align with the covenants on our senior unsecured notes, and addressing all our unsecured debt maturities through July 2023. The new facility consists of a $685 million secured line of credit and a $500 million secured term loan. At closing, we utilized our new line of credit to reduce the principal balance on our unsecured term loans from $695 million to $500 million. The principal balance on the term loan will be reduced by $35 million per year in quarterly installments. The facility matures in July 2023 and bears interest at a variable rate of LIBOR plus 225 basis points. The annual facility fee, to be paid quarterly, ranges from 0.25% to 0.35%, based on the unused capacity of the line of credit. The facility is secured by a portfolio of the Company's Properties consisting of 17 Malls and 3 Associated Centers and contains customary provisions upon which the Properties may be released from the collateral securing the facility. The company is losing headroom under its covenants, and if it requires a waiver, it will have to pay up for one (in a prior life, I was one of those people the company would come to for a waiver and we would make it pay for it and pay up for it). This means, even if it can waive a covenant if it is about to breach, it will cost it a decent amount of money and now nearly all of its debt will have to get paid to consider it. Importantly, the renewal/recasting of the bank lines has bought the company time to right the ship. It has no significant maturities (recourse) until July of 2023. I still worry about the covenants, it is my bias as a predominately credit guy. That said, if you really want to position the company, you might consider the bonds (as most don't have access to bank syndicates). 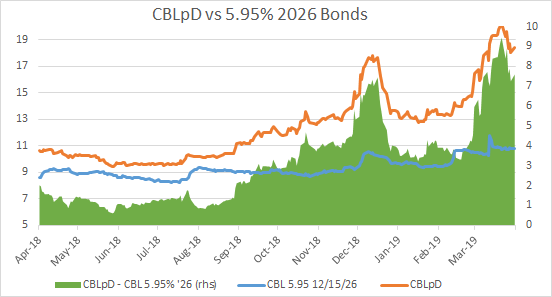 It is important to understand that the bank lines front-run the maturity of the unsecured bonds (as they normally do in these cases). The earliest maturity is the 5.25% of 2023 notes, which currently yield near 12%. The "give up" for the additional security of the notes is also near its wides at nearly 700 basis points (7%). 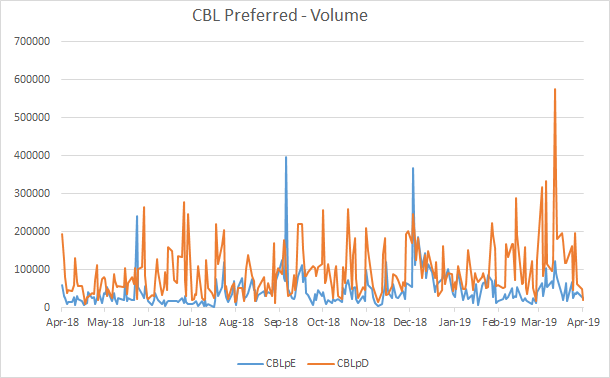 Do you like the preferred stock of CBL? I like Ds more than Es, but they are not doing well. 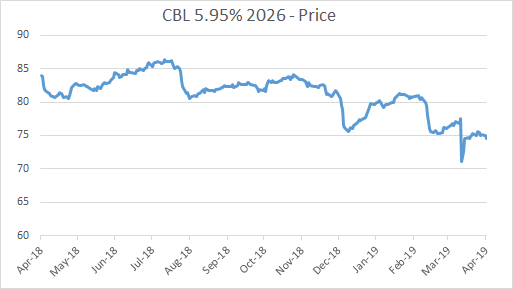 I do not like the preferred stock of CBL. Would you buy it here or there? I am not a buyer of preferreds here or there. I will not buy the equity anywhere. Not a buyer is what I am. I do not like CBL, Sam-I-Am. Would you like to buy its notes? Do you like the covenant moats? I am not a buyer of its notes. Ten points lower might help create a moat. I am not making light of the question asked of me or impugning the intelligence or thesis of owners/buyers of CBL, I am merely responding in a manner that the individual requesting the opinion is used to.